If you are interested in making a trip to Haiti with our STJW Mission Team, please complete this application form and return it to Deacon Kevin. You can fill it out with a pen, and send it, or if you have one of the latest PDF tools, you could fill it out using typed text messages. There are typically two trips per year, generally in March and November. They will vary based on travelers schedule, cost of travel and the needs of the people of Bouzy. To attend these trips please fill out the application form. Completed applications will be sent to Deacon Kevin O’Connor. A member of the Core Committee will reach out to set up and conduct an interview. The interview is an opportunity for the applicant and the committee to become familiar with each other and the mission. Once all of the above is completed, formation will follow. You will be required to attend formation meetings, the packing session and Commissioning Mass. See the formation link above for more detailed information. Jill Kitterman – previous traveler. Suzanne Koenigs – Haiti Core Committee Member / Formation leader / previous traveler. Suzanne can also be reached at cell 612-910-6024. If you have any questions of a general nature regarding Haiti, please contact Deacon Kevin O&apos;Conner. Dr. Jeff Freed, Dr. Mark Millis, Lori Henke R.N., Suzanne Koenigs, Ann O’Connor R.N., Deacon Kevin, missing in the photo is Pat Grev R.N. April 2019 Haiti Missino Team Commissioning at Mass the weekend of March 24. It was amazing to meet our brothers and sisters of St Catherine’s. They are loving and caring people who have very little but are rich in faith. Bringing us gifts of fresh fruits and coffee after our first morning Mass was a very humbling experience. If you hardly had any food to eat – would you give it away to visitors? The senior citizens at church impressed me as they were always dressed nicely; offering a hug and kiss or handshake when greeting us. I was very inspired with the people at morning Mass; some of them walk a few miles in the dark to arrive for 6:30am service. Others may have come on the back of a motorcycle on rutted, muddy, rocky dirt roads and paths (very different than 94 and 494!). One man rode his donkey. Whatever it takes or however long it takes – they will be at church to praise God for all they have as it is clearly the center of their life. I could see Jesus in the faces of each one and think of them often since I have returned as they are forever with me. Rejoice in the Lord always. I shall say it again: rejoice! Your kindness should be known to all. The Lord is near. Good evening, my name is Jake Smith and I was fortunate to be a part of a team of six that traveled to our sister parish Saint Catherine’s in Bouzy, Haiti earlier this month. That passage that I just read from Philippians was from a bible reading our team did one evening while in Bouzy. It really hit home for us as we sat in the midst of the kindness that surrounded us by the people of Bouzy. We knew the Lord was near...and therefore we had no choice...but to rejoice. And boy did we ever. We knew the Lord was near when Father Claude met us upon arrival in Bouzy and told us "Welcome home". And he and the people of Bouzy made sure we felt at home the entire week. We rejoiced by visiting with the people, singing songs, dancing, and playing frisbee with the kids. We knew the Lord was near when we met with the parish council of St. Catherine’s. They told us our support is making a difference with the school, the clinic, and the church. They told us that they loved us…and that we are their brothers and sisters…and that they are praying for us…and ask that we continue to pray for them. We rejoiced by telling the parish council that we are indeed their brothers and sisters...that we love them...and that we could feel that they loved us. We told them that we will pray for them and asked that they continue to pray for us as well. We knew the Lord was near when we walked into that mass on Sunday morning and heard those children signing...all sitting in front...dressed so beautifully. It sounded like angels of heaven singing. It was a sight and sound to behold. 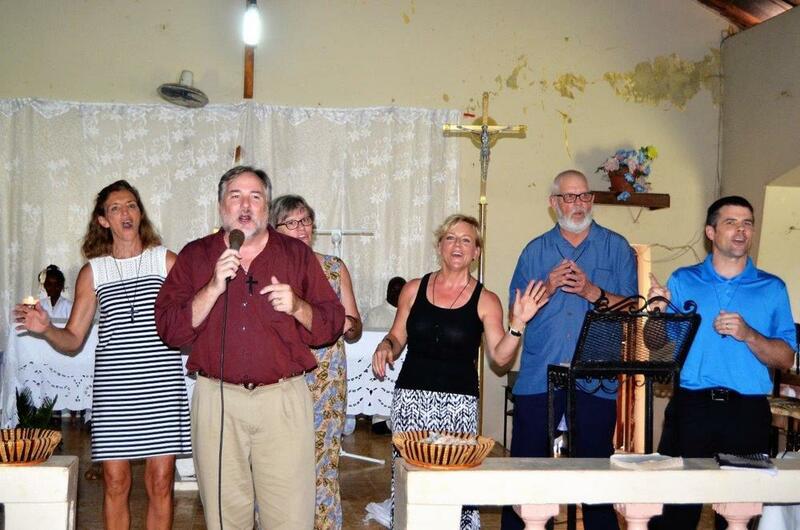 We rejoiced in mass when our team sang to them "Jesus he&apos;s done so much for me. I cannot tell it all." Now don&apos;t worry because Barry lead us in the singing...not me. We knew the Lord was near when during Father Claude&apos;s homily he told us that "the people of St. Catherine&apos;s love us the way that God loves us." We rejoiced during the 20 minute long "sign of peace" by walking through the congregation exchanging handshakes, hugs, and kisses. All while those angels continued to sing. And we rejoiced when we saw Father Claude walk through and hug or shake hands with every person in mass. Estimated at around one thousand people. We knew the Lord was near when we visited the schools and the children greeted us by singing back to us "Jesus he’s done so much"
We rejoiced by teaching them more songs and unique ways to tell them that "I love you". We knew the Lord was near when we were guided safely along every step of the way throughout our week long journey. We rejoiced by going back to that river and singing, "Let the river flow." Now, we are approaching our ten year anniversary of our relationship with St. Catherine’s and next weekend there will be a second collection for our brothers and sisters in Bouzy. Your time, financial support, and prayers are dearly appreciated. In closing, I would like to leave you with the ending passage to that bible reading from Philippians. Our fall team, with the help of our brothers and sisters in Bouzy, had an amazing God filled week. Together we sang, we laughed, we played, we prayed. We visited the school many times during the week. Each visit brought us closer with the children. Deacon Kevin sent some books with us. One of my best memories is spending time reading with the preschool children. Thank you for the opportunity to represent St. Joseph the Worker! The people in Bouzy, Haiti are our family. Like everyone, I love to go and visit family. The most important part that I am reminded of is what truly matters in life – God’s love. Not the materialistic “stuff” we clutter our lives with. I am grateful to the parishioners of St. Joe’s for supporting this amazing ministry. For many years I’ve supported our sister parish spiritually and financially. I’ve been impressed and intrigued as I’ve listened to the many trip reports from other parishioners. I have been particularly captivated by the letters from Fr Claude as he describes what our partnership has meant to the people of Bouzy. Recently it’s become more clear to me that our friends there do not need to be fixed or taken care of. Instead, they need to be loved, to know they are not alone, and that they have ‘family’ here at St Joe’s that will be there for them. I’m proud to be part of our faith community at St Joe’s, and I’m excited to visit Bouzy, to share our love and support, and be part of building a long lasting relationship where St Joe’s and St Catherine’s can develop a deep relationship as we grow together in God’s love. In talking to our parishioners who have gone to Haiti, really amazed me. Stories of faith, healing and supporting the people of St. Catherine’s is incredible. THIS is what gave me the calling to go to see how we have assisted in shaping the current state of Bouzy, but most importantly how they will help shape and develop me. To serve and to learn. I believe my purpose in life is to serve. I believe that true joy comes from serving others with love and compassion. Also, as a father of four, one of my primary roles is to teach my children. I feel that I cannot be a good teacher unless I am continuing to learn myself. I would like to learn about other cultures, other countries, and meet people in different situations from around the world. I have a passion for Catholic Mission and have been interested in serving with our sister parish. I am also excited to experience their joyful worship and hospitality that has touched the lives of so many who have visited. I hope to continue the relationships St. Joe&apos;s has created with the adults and youth of St. Catherine&apos;s. I am looking forward to experiencing their worship and bringing some of that experience back to our faith community. Have you heard the call to visit our sister parish, St. Catherine’s in Bouzy, Haiti? Contact us if you are interested in koinin gus on a future mission to Haiti. Tough way to wake up! Yes, Lord, I reluctantly replied. I love our Haitian friends, so I accept vulnerability & loss as possible costs of love. I don’t like it, but I accept it because love is such a gift. This I learn from you. For a long time after that, I wondered, What did God mean? What cost of loving our Haitian friends will I discover next? When will the other shoe drop...? The greetings, hugs, and visits we enjoyed daily in Bouzy showed me that we are beloved family now. When we dare to love family profoundly, and without reservation, we do risk broken hearts. We had many joyful times at St Catherine’s in worship, dinners, visits, and school & clinic time. Moira and I particularly enjoyed visiting the school children & having them sing to us & quiz us, while others met patients in the clinic. Great gifts. But I also had many visits where I just listened to deep struggles of our friends, which wore me down. I listened attentively to teachers in Bouzy & Duverger, to the men’s group & water committee, who all recited litanies of deep, urgent needs. I could only tell them that Fr Claude decides which of the many community needs we might help with our limited funds. I also promised that we would be with them, would pray for them, & would carry their needs back to the people of St Joseph the Worker. Our presence & attention does make a difference, it brings hope, but we cannot solve poverty there. Hearing their struggles doesn’t make me want to avoid such situations because we are family now,& we honor them & participate in their struggles in small ways by listening compassionately. I’m learning that these tensions & heartbreaks are just the cost of a precious loving family life. Our family has grown to include our Haitian friends. Thank you, God. Like Jesus we bear the pain of helplessness, abandonment, & resistance to the cost of love, knowing that in loving through these heartbreaks, we bring life-giving hope & joy to each other. Thank you, Lord, for all the gifts of these generous people, even the painful ones. My name is Traci Lemcke and I am proud to have been a part of the Medical Mission Team that went to Haiti in March of this year. This was the most impactful trip of my life. We were on the home visits, in a home with a dirt floor where they were sorting beans and breadfruit in a basket on this same floor. In walked a sweet boy about the age of nine. He had patches of hair missing and sores all over his body from untreated ringworm. He smiled at me and we took our picture together. That moment will stay in my memory forever. I still worry about the sweet lady who came to the clinic with a blood sugar reading higher than I had ever seen. I was and still am so scared for her. All of this from lack of ability and financial means to obtain medical care. When we arrived the medical shelves were empty and most of the people had gone for an extended period without medicine and much needed medical care. We filled those shelves. People walked to receive what care we could provide them, some for miles to get there. The clinic where we treated patients and dispensed medications was packed. Many sat there all day and were sent home without care. Not complaining when sent away. We only have room to add so many to the program due to lack of funds. They were patient and peaceful and would smile at us and give a hug, thanking us for coming and doing what we could for them. This broke my heart. Blood sugar readings were so high in some cases that if we were in the United States, we would have immediately called an ambulance. Hypertension had gone untreated due to lack of medication causing irreversible damage and shortening lives. We spent time at the Kindergarten and watched as they played on the playground equipment made possible by your donations. The children were excited to see us and extremely happy. They looked adorable in their school uniforms. The smiles and hugs, kisses on both cheeks, and multiple times they would reach up just to touch my hair or my face I can still feel today. The school put on a dance for us and the Knights of Columbus soccer team played against another local school to show their appreciation for us being there. They looked great in the new uniforms donated by our Council of the Knights of Columbus. Children of all ages came to greet us, took photos with us and wrapped us up in their arms. I don’t think I have ever felt so much love from complete strangers. It got to a point where there were so many wanting to hold onto me at the same time that I was nearly pulled down to the ground. I felt so loved in Haiti a feeling that will forever remain in my heart. Our Medical Mission was possible because of the donations of this parish. Your donations have allowed change, construction, medical care, and safe water to drink and cook with. The money you donate makes this possible. Your Prayers and love are needed and much appreciated. Join Our Medical Committee - they bring medical care to our Haitian brothers and sisters addressing the needs of this community. Purchasing necessary medications for High Blood Pressure, Diabetes and Deworming. Join Our Water Committee - they created 6 safe wells in the Bouzy community for everyone to have water that is safe to cook with and drink. Participate in Our Haiti Fun Run - this happens during our outdoor mass in September. It raises money, creates joy and enthusiasm in our parish and a way for all ages to support our sister parish. Thank you for your donations, love and prayers for our Haitian Brothers and Sisters. I fell in love with the people of Bouzy. They treated me with love, care and compassion. Showing me more love than I have been shown in a long time. They give completely of themselves. They trust in the Lord. They love unselfishly. They have given me far more than I could ever give to them in return. I love the people of Haiti. When you get a chance to know them, you will fall in love too. Join us in supporting our sister parish, become the hands and feet of Christ. Bouzy comes alive in the darkness around 2:30 am with the roosters. There is no ‘sleeping in’. I’m up to get ready for Mass at 6 am. It’s still dark as I enter the church. When Mass starts however, I am surrounded by twenty ‘singing Bouzy friends’ behind me, and some of my St. Joe’s ‘family’. I am greeted with hugs and kisses on my cheeks. Daylight enters the church. I am so familiar with St. Catherine’s now. I see every crack in the walls (though new ones appear every year). After Mass I follow Father Claude to the school next door. He’s still in his alb as he greets the students and, offers a prayer with them. They then recite the pledge to the Haitian flag. These kids are wearing their peach and brown colored uniforms. There’s a new ninth grade class this year. Will there be a tenth-grade class next year? Women are outside cooking a meal for the kids because of a new food program, so all are promised a nutritious meal. I go across the street to the kindergarten (3, 4, and 5 year-old kids) who are dressed in their red and white plaid uniforms. They are playful, happy, and somewhat shy. Some are on the playground (thank you St. Joes). Classes are much larger here – hope for the future. Breakfast is being prepared in the street for these young kids too. Walking back down the street Bouzy has come alive. Small markets (candy and produce) line the street, with a larger ‘market’ at the end of the road. Motorcycles, a few cars, many walkers, the tooting of horns fill the air, kids carrying water in buckets from the well, add to the life before me. It’s another sunny, warm, bright dry day in Bouzy. The rains haven’t started yet this spring. There is a comfortable routineness in daily life here. I forget that ‘I am different’. I feel comfortable here in Bouzy. The fortunate ones are those who have ‘a place to go’ in the morning. There are not enough jobs. Many kids have not been enrolled in school as their parents can’t pay the tuition. I cross the street to the clinic. Every seat in the waiting room is filled with people patiently waiting to see our doctors. The dispensary is filled with medications (from St. Joes and the World Health Organization) to help meet their medical needs. Patients will wait as long as needed without complaining. I’m at home here in Bouzy. It’s a gift. You can have this opportunity too! You just have to say ‘Yes’! Your life will be changed! Talk with Deacon Kevin for more details. While in Bouzy, Haiti, we set our phone alarm for 5:30 a.m., to go to 6:00 a.m. Mass. It was just before dawn as we walked from the rectory to the church of St. Catherine. The interior of the church was in deep shadows as the cement block windows let in a little predawn light. We sit on the wooden benches (no backs to the benches and no kneelers). We are soon surrounded by the ‘church ladies”, 20 or so elderly women and 2 men, who come to daily Mass. They sing all the parts of the Mass with Father Claude in Creole and French. They kneel on the hard concrete floor from the Sanctus to the Our Father. We do not know their names, but we recognize their faces. At the Kiss of Peace, we say, “Lape avek ou” or peace to you (in Creole). They respond with “Lape.” They give us a warm hug and kiss us on both cheeks. All twenty of them and the two men, too, come to greet us. All the church ladies wear hats or scarves to cover their head. It is a generational thing. I notice at the Sunday Mass that the young women and girls no longer wear hats to church. Only women of a certain age; like above 50. It is an art to kiss on both cheeks when both participants are wearing hats; how to angle your head so that the brim of my hat does not dislodge both hats. I am trying to learn this art. On the second weekday Mass, we brought rosaries to hand out to the daily communicates after Mass. They were delighted with our gifts. The next day, one woman brought a basket with a bunch of bananas and three eggs to give us. We thanked her gratefully and took the basket with the food to the cooks in the rectory who served her gift for our breakfast. The story of the widow and her copper coin came to my mind. She gave from her need while I give from my abundance. The church ladies are always so warm and gracious in welcoming us back to Bouzy. They greet us with smiles, hugs, and kisses like we are long-lost friends. They are the faithful ones; holding all of us up in their prayers. After weeks of listening to Creole tapes at home, I can recognize some words in Creole. During Mass, I hear the words “Sainte Jozef” and “Minnesota” and realize that during each Mass, they are praying for all of us at Saint Joseph the Worker parish. In the prayers after Mass, we are mentioned again. I am humbled by their graciousness, generosity and faithful prayers. As we would travel throughout Bouzy and other surrounding villages, I was struck by the living conditions – it is one thing to hear about it or see a picture, but it is a whole different level seeing it in person. Dilapidated huts, dirt floors, no running water, no electricity….sit and think about that. Could you live in those conditions? I know I couldn’t. Even in preparing for this trip, I kept thinking about “How can I make it for a week without blow drying my hair!” There are so many necessities we take for granted. But if you did live in those conditions, could you sing God’s praises every minute of every day, as they do? 2 weeks ago, a few days after we returned, Fr. Don showed a few pictures during his Homily about a river and us getting carried across. Maybe some of you have heard, but there was a reason we were carried. Daily life for them involves crossing a creek to enter Bouzy since there are no bridges. The 5 of us, our 2 translators, and a Deacon from St. Catherine’s were returning to Bouzy, and it had been raining for about an hour. As our SUV entered the creek, it quickly became a river, and the term FLASH FLOOD became a reality. In seconds it swelled from the height of the running boards then into our vehicle ankle deep, within a few more seconds -- depending on where you were sitting – the water was chest or shoulder height. The windows wouldn’t go down nor doors open, and what seemed like minutes, but was maybe only 15 seconds, until our driver, Marco, finally got his door opened. The 8 of us worked flawlessly as a team, no one panicking, and Dan Koshiol showing the most heroic act I have ever witnessed by saving Fr. Don. But without a doubt, God was with us, and we all made it back to shore after some terrifying moments in a 3-4 minute time block. The next 3 ½ hours became a community effort. Hieu Tu, who had lost his shoes in the swift current helping Michelle Bartley and me out, was standing in unsanitary water when a woman came up to him, her flip-flops in hand, and said in her sweet Creole voice “Here, you need these more than I do.” All while 10 Haitians are trying to get the SUV out. Eventually, the water started to recede, and they carried us across. They even had placed 4 guys in the water that were pillars, as a human chain in case something happened to us. They risked their lives for our safety. The following morning, 4 women came to the rectory. They heard about the river incident and had been praying for us, and expressed their love and concern with hugs and kisses. The next evening, a woman and her husband walked a mile from a neighboring village with some bottles of water and beer. They also heard about the event and wanted us to be able to relax and enjoy some downtime. The last 9 years we have provided monetary support, all while St. Catherine’s has said they have nothing to give us in return. I am here to tell you that they do. Their love – compassion -- and Faith in God are immeasurable. We appreciate your prayers, time and financial support. Thank you. The past visit with our brothers and sisters in Bouzy, Haiti was filled with dramatic events/experiences/encounters! I say this not to sensationalize, as the media does, to grab your attention. But more, to point out the wonder, the beauty and the intensity of the faith life of our brothers and sisters. As you would most likely assume they live on the edge of life and death. I saw an ambulance with a casket on top of it. (In reality, if we were honest with ourselves, we would have to say the same about our lives.) However, the dire need of the basics and the lack of any infrastructure would make it more obvious that their lives are at risk. The bottom line of what makes these stories of our visit to Haiti dramatic is how our brothers and sisters live with such great joy and deep love in the midst of such dynamic struggle. I would like to mention a few of these experiences here. However, I fear, because of the limitations of this article, I&apos;m not able to fully describe how blessed I have become for having been with them. Because of this, I strongly suggest you consider ways by which you can come to know what these experiences mean by: 1. Coming to a presentation the visiting group will be offering. 2 speaking to the individuals of the visiting group personally. 3 paying attention to the different articles that will appear in print. I have a hard time ranking these events so I will name them in chronological order. Selfless generosity I was struck throughout the trip as to the utter dependence we visitors had on our Haitian hosts in looking towards every basic need and daily activity. From understanding where we were to go and when to trying to grasp the meaning of a conversation, I felt like a child needing the guidance of adults to maneuver through life. What makes it dramatic for me is the selflessness that are hosts expressed in attending to our needs. In the midst of trying to provide for their own needs or, better said, dropping their concern about themselves in trying to survive to they focus totally on us. They were constantly concerned for our safety and comfort. The gift of hospitality Father Claude was exemplar in this regard. The efforts that he has made in preparation to our visit, the attentiveness to every detail of our stay, and his personal contact with each one of us were ways by which he showed how much he cared for us. What makes this dramatic for me is the amount of work for him and his staff to manifest this amazing hospitality. Practically speaking, Bouzy is in the middle of nowhere! It is amazing how much effort it takes to bring supplies (I&apos;m thinking of not just the food we ate, but also the electricity, water and other materials to accommodate the house) into Bouzy. Most traveled by walking or moped. We and our goods were transported by the luxury of a van or SUV. Throughout the trip, we learned what it takes to operate and maintain one of these vehicles. It usually takes 10 times the average annual salary to do this. The context of life makes this all truly amazing! The gift of faith Another dramatic experience was our Prayer times we had together. The joy, the enthusiasm and the wonderful heartfelt participation in their communal prayer was truly inspiring and uplifting. It was immediately obvious to me that the Eucharist is so significant to them in the way that they came from many miles on foot in elegant fashion to come on time to pray, gather and welcome us to be with them.Their Sunday morning celebration is indeed an expression of who they are. The gift of life Inevitably, you will hear about the dramatic river event, wherein eight of us escaped the incredibly fast rising, raging river. Yes, there was danger involved and and yet there was a calm, orderly and well-orchestrated effort to help each other into the embrace of safe, loving concern of so many people. Daily life involves crossing creeks as there are no bridges. The five of us with our driver, Marco, our interpreter, San Louis, and that Deacon of the parish, Charles were crossing the creek after the second mass Sunday morning. As we entered the creek, it quickly became a river. What was running board height upon entering the creek became the depth of over the hood of the car in a matter of a few minutes. With the presence of God, the peace and the Spirit pervading the group and selfless consciousness for the good of the group, we are all able to reach back to the shore which we came from. The next hours of the afternoon involved rescuing the car out of the river with the help of most of the village. It was quite a community event and a time of rejoicing in God&apos;s goodness to us as manifest through the wonderful concern, collaboration and unbelievable kindness of the Bouzy community. The gift of gratitude The last dramatic event was a home visit of a wonderful elder woman whose sweet spirit was exemplified by her gracious reception of our spontaneous passing by. Her weakened, fragile body was only supported by a mattress on a dirt floor. But her faith and joy seemed to emanate from a palatial throne of openness and immense love. She was so pleased to have the opportunity to express her gratitude for her long blessed life. She proceeded to tell us about her meaningful and fulfilling service to the church in the choir, in cleaning the church and setting up for mass. I could see in her glaucoma clouded eyes tears of happiness of having been able to give her life to God in this way. I remember thinking all the while that I wished I could end my life with such fulfilling gratitude. I tried as best I could to tell her how grateful I was for her witness and for her love. I asked her to pray for us, for we so much needed which she has been blessed with in her life. Why am I going to Haiti? What our Haitian trips involve? Our mission trips have largly involved a)improving the health of the Parish members, b) Health education, b) water improvement systems, c) electrical infrastructure improvements, and d) general facility upgrades. If you want to see and read more, we have a 2 page brochure which provides more details about our trips to Haiti. After completing the application and interview process, formation will begin. Pre travel formation is typically three to four sessions that focus on getting ready to visit our brothers and sisters in Bouzy. All members are asked to attend each meeting. The meetings are set to the schedules of the group. Travelers are also expected to participate in packing and attend the commissioning mass. These activities typically take place the weekend before travel. After travel requirements consists of a debriefing session, communication to the St. Joseph Community, and speaking at one mass about experience. Each person comes to the mission with a different purpose and calling. The mission of the team is to continue the formation of our relationship with St. Catherine’s. You will be representing both yourself and the St. Joseph Community. Each team member will be asked to pay half the cost of the trip, $750.00. This number is calculated from the average cost of previous trips. Many team members have done fund raising to cover their portion of the trip. If someone would like to travel to Haiti and the cost is deterring their ability to travel. The leader will work with them to cover the cost.